In a battle of two AFC teams flaunting top-tier defenses and questionable-at-best offenses, the clash between the third-seeded Jaguars and sixth-seeded Bills was the epitome of a knock-down, drag-it-out fight. Neither team’s offense could solve the other’s relentless defense, as Buffalo’s quarterback Tyrod Taylor completed less than half of his passes and no touchdowns, while Jacksonville’s Blake Bortles and Leonard Fournette were similarly smothered by the Bills’ defense. With a score of 3-3 at halftime, both teams battered each other relentlessly for the rest of the game as well, with Buffalo’s defense giving up the only touchdown of the game in the third quarter to make it 10-3. With one last gasp in the fourth quarter, the Bills finally went down after Tyrod Taylor suffered an injury, and backup Nathan Peterman threw an interception to seal the win for Jacksonville. Coming into the game, most analysts saw the Titans as a fun little blip in the NFL Playoffs. Led mostly by young players, particularly rising star quarterback Marcus Mariota and running back Derrick Henry, they were expected to fall to the far more experienced, fourth-seeded Chiefs, who had finished the season with four straight wins behind resurgent quarterback Alex Smith. The first half went about as expected, with the Chiefs using their veteran talent to corner the fifth-seeded Titans, and when halftime came, Kansas City was up 21-3. The rout appeared to be on, but with the start of the second half, a completely different Tennessee team appeared. Behind Mariota, the Titans struck back, capping off their first drive with a touchdown pass from Mariota deflected by star cornerback Darrelle Revis. In what has to be considered one of the wildest plays of the season, the ball popped into the air, and back down… right into the hands of Mariota, who managed to weave his way into the endzone, for the first ever playoff touchdown to be caught and thrown by the same player. From there, things seemed to start clicking for the Titans, as they stormed all the way back, scoring two more touchdowns to go up 22-21. The Chiefs tried time and time again to stop Tennessee and come back, but their momentum appeared to have run dry, and when the clock hit zero, the Titans had pulled off the incredible comeback and upset. Meanwhile, in the NFC, the sixth-seeded Falcons attempted to defend their conference championship title, facing off against the third-seeded Rams. For the Rams, in their first playoff game since returning to Los Angeles, youth and energy wasn’t enough to overcome the championship pedigree of Atlanta. While they stayed within striking distance, they never managed to take a lead. Defenses once again proved to be the difference; while the Rams defense only gave up several field goals, the Atlanta defense clamped down, only allowing 3 points in the second half. Moreover, while the Rams showed a great deal of potential, at the game’s conclusion, the Falcons were well on their way to defending their NFC crown. After suffering an inexplicable regression a year prior and completely missing the playoffs, the fifth-seed Carolina Panthers looked resurgent this year, compiling an impressive 11-5 record. Coming in second in their division to their rival and first-round opponents in New Orleans, the opportunity was there for Carolina to reclaim their glory of years prior, and simultaneously stick it to their division rivals. But three words dictated this matchup, the same three words that have doomed countless opponents of New Orleans to an offensive onslaught – quarterback Drew Brees. While the Panthers planned for and successfully contained the Saints’ potent running game, they had no answer for Brees, who amassed an astounding 376 passing yards and two touchdowns. While Carolina quarterback Cam Newton managed to nearly match Brees’ statline with 349 passing yards and two touchdowns, the Saints defense managed to contain him long enough to send the Panthers home disappointed yet again. In a game that wasn’t even as close as the lopsided score would suggest, the first-seeded Patriots absolutely shellacked the Titans, to the surprise of no one. After Tennessee struck first, going up 7-0 and stunning New England, wild dreams of the Titans finally dethroning the NFL’s Evil Empire looked plausible. But as is always the case with the Patriots, they simply bulldozed the Titans, scoring 35 points in a row throughout the remaining three quarters before allowing what looked like a consolation score to the Titans with 2 minutes left to go. Just like that, after making the Titans look like a warm-up match, the Patriots booked their place in the AFC Championship match. While the Jaguars’ last game had featured their stellar defense, this one showcased an absolute explosion from their offense. In a stunning upset, the Jaguars jumped to a 28-7 lead in the first half, looking absolutely dominant over the favored Steelers. But behind the unwavering spirit of quarterback Ben Roethlisberger (throwing an incredible 5 touchdowns and 469 passing yards), Pittsburgh clawed its way back, cutting the lead within a touchdown time and time again. But every time the Steelers struck, the Jaguars struck back, until the game was 45-35 Jacksonville with under 2 minutes remaining. A last-second touchdown by Pittsburgh only served to make the score appear closer, as Jacksonville set its sights on New England. This game could be described as two distinct halves – one where the Vikings built up a 17-0 lead, and another where they gave up a 24-6 run to Drew Brees and company. But its defining moment won’t be either of those, or anything, really, besides the play now known as the “Minnesota Miracle.” With ten seconds left and no timeouts, facing a 3rd-and-10 at their own 39 yard line, the odds looked bleak for the Vikings. But when Minnesota quarterback Case Keenum threw a perfect pass to receiver Stefon Diggs at the Saints’ 35 yard line, Saints defender Marcus Williams not only missed the tackle, but took out another Saints defender in the process. This created a wide-open path to the end zone for Diggs, and pandemonium erupted in Minnesota as he gave the Vikings a 29-24 lead with no time left. And with one of the most memorable plays of all time, the Vikings were headed to the NFC Championship Game. Rather than one play, the match between the defending NFC champion Falcons and the first-seeded Eagles came down to a series of downs, though it was no less exciting. 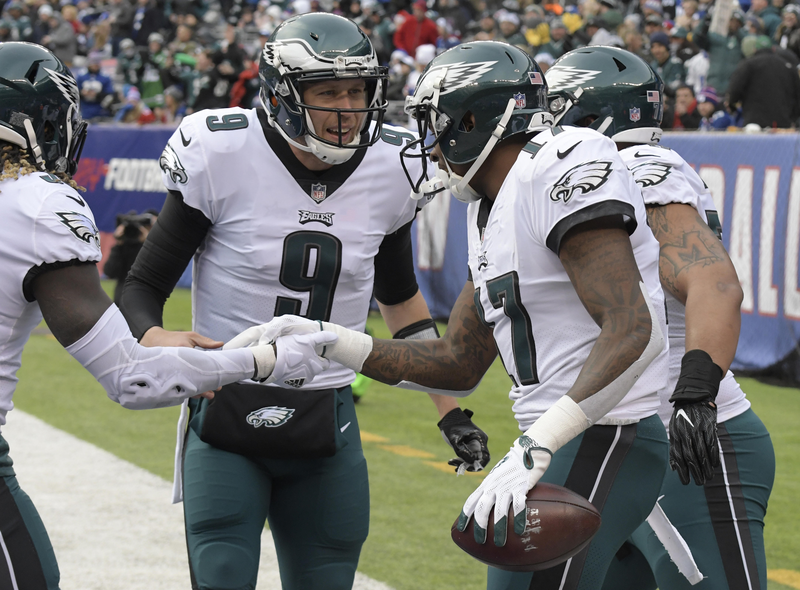 After a match where the two teams had fought almost to a stalemate, the Eagles (led by backup quarterback Nick Foles) had a 5 point lead – not enough for a field goal to tie it, but enough for a touchdown to take the lead. With a first down inside the Eagles’ 10-yard line, behind Matt Ryan, the Falcons looked to have that touchdown in hand. But with four straight opportunities to gain eight yards, the offense collapsed, and an incomplete pass from the 2-yard line that went between the hands of Falcons receiver Julio Jones booked the Eagles’ ticket to the NFC title game. Outside of New England, this was a game where everyone was hoping for an upset – for the rising Jaguars to topple the seemingly endless dynasty of the Patriots, and usher in a new era. After an early score by New England, the Jaguars were looking to do just that, scoring two touchdowns in a row to go up 14-3 on the AFC’s first seed. Just before the half ended, the Patriots managed to close the gap to 14-10, but Jacksonville responded with two field goals to lead 20-10 at the start of the fourth quarter. As he’s done so many times in the past, though, New England quarterback Tom Brady led the comeback, scoring a touchdown to close the gap to 20-17. After a set of defensive stops, another Brady touchdown made it 24-20 Patriots, and a last-gasp effort by Jacksonville fell short. To the dismay of the rest of the NFL, the Patriots punched their ticket to their third Super Bowl in four years. The matchup between the Vikings and Eagles was billed as a clash of two NFC titans. 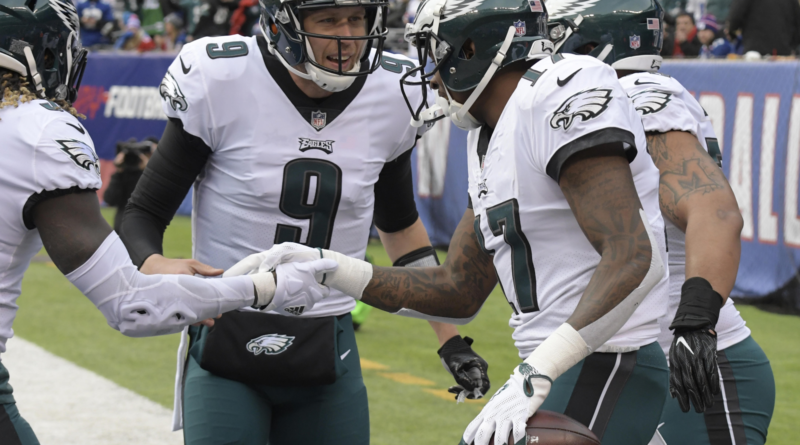 Even without their star quarterback, Carson Wentz, the Eagles offensive and defensive talent made them an all-around juggernaut. The Vikings, by contrast, were led by Case Keenum, a veteran quarterback getting his first long-term starting opportunity, and a lock-down defense giving up the least points in the league. It looked like an incredible showdown in the making, and the Vikings’ first strike, a ten-minute touchdown drive to go up 7-0, only appeared to prove it. But from there, they inexplicably collapsed. In leading his team to score 38 unanswered points, Philadelphia’s quarterback Nick Foles threw for 352 yards, three touchdowns and no interceptions. In the blowout loss, the Vikings followed up their initial touchdown with three punts and five turnovers. The highly-billed matchup was more like an unadulterated beatdown, and the Eagles strolled to their first Super Bowl since 2004. Of course, the biggest game remains – the Super Bowl, the clash between Philadelphia and New England. Who will come out on top? The feel-good story of a backup quarterback leading his team past a devastating injury, or the relentless push of the Patriot machine? There’s only one way to find out, and it’s to tune in to football on Super Bowl Sunday! If the Steelers win their first game, they would play in the AFC Championship Game against either the Patriots, Bills, Titans or Chiefs.